Good morning! 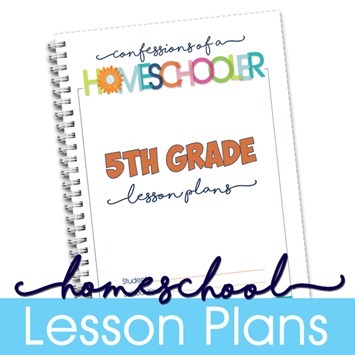 Today I’m releasing my 5th Grade Daily Homeschool Lesson Plans! While some times people prefer to be spontaneous, other times I think it’s better to have a plan to follow so things don’t get missed or left behind. Planning ahead is especially important if you’re a new homeschooling. Having a good plan will help make your days less chaotic and stressful, while giving you the comfort of knowing you’ve done everything you need to do on a daily basis. And having a good plan will also allow you to be more flexible when something fun arises! It’s my opinion that if we can conquer each day, then we’ll conquer each week. If we conquer each week, then we can make it through the month without getting off track. And eventually, by making it through each day, week, and month, we can finish the year strong knowing we’ve completed everything we need to do to move our child on to the next grade level with confidence! I’ve done all of the hard work of planning and organizing your day for you, all you need to do is print them out and follow along! I always get requests for our exact lesson plans for different grade levels, and so I’m so excited to be sharing my homeschool lesson plans with you all! And YES, I will be releasing lesson plans for more grades coming soon! These plans use the exact curriculum that we’ve used for our children, and hopefully they’ll be able to help you too! Most importantly I’m hoping my pre-made homeschool lesson plans will help you save time and stress by having all of the planning done for you! We’ve been homeschooling for over 11 years now, and as you can imagine we’ve tried just about everything. I’ve complied our favorite curriculum in these lesson plans to help make your life a little easier and enjoyable! 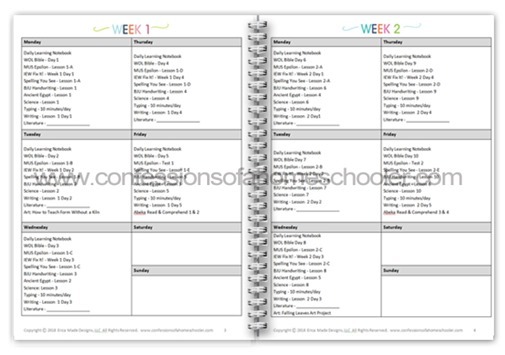 My daily lesson plans include everything you need to do to complete an entire year of fifth grade homeschooling including daily assignments for 34 full weeks of homeschool. They include daily learning activities for Art, Bible, English, Handwriting, Math, Phonics, Reading, Science, History, Spelling, Typing and Writing. I know my exact curriculum may not work for all of you, so I’m also releasing an editable version for those of you who would like to use my lesson plans as a backbone, but be able to edit them to fit your own specific needs as well. **These plans include main subjects to complete fifth grade level work with your student. That said, you’ll want to check with your local state homeschooling requirements to make sure you are following their requirements as states can vary. These lesson plans utilize the resources listed below which must be purchased separately. For your convenience I have written them out in daily lesson plan format for ease of use. You can then print the assignment booklets for you and your students to use each day, and just follow along. It’s as easy as that! Note: You will want to keep your curriculum’s teacher’s manuals handy as a more detailed guide if there are special projects or activities included. Art: Deep Space Sparkle Free Art Lessons (These are free online lessons. For the weekly art lessons you’ll want to click on the link above, then search for each post as indicated in the lesson plans. You are welcome to do a different lesson than what is suggested, it’s totally up to you! TIP: You’ll want to check to see what supplies you need before each week’s lesson.) Optional: If you prefer a more structured video tutorial type art lessons you may use Home Art Studio DVDs or Atelier Art DVDs. I suggest printing the lesson plans, then having them spiral bound at an office supply store. 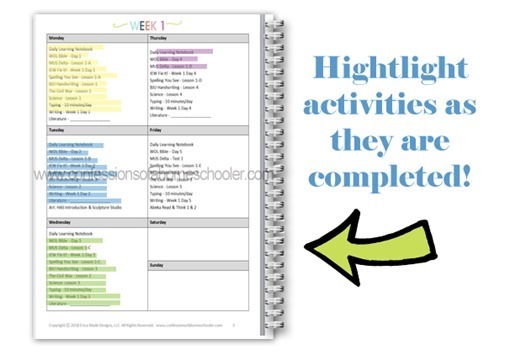 Then students can highlight activities as they’re completed. You can also print a copy for yourself if you would like! 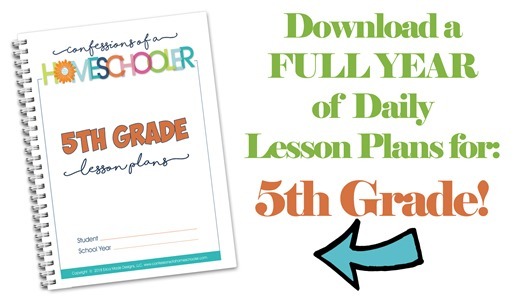 –>> Get my COMPLETE HOMESCHOOL DAILY LESSON PLANS for 5th Grade here! **PLEASE NOTE: These plans include main subjects to complete 5th grade level work with your student. That said, you’ll want to check with your local state homeschooling requirements to make sure you are following their requirements as states can vary.